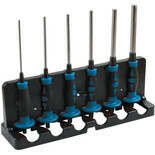 5 pin punches 5/32" to ¼"
5 taper punches 3/32" to ¼"
3 cold chisels 3/8" ½" & 5/8"
2 centre punches 1/8" & 3/16"
A useful selection of punches and chisels for general building maintenance and repair work, manufactured from tough chrome vanadium steel with a fine sandblast finish. 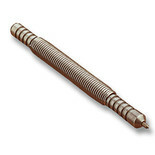 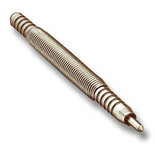 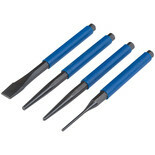 A useful selection of well sized punches and chisels for general building maintenance and repair work, manufactured from drop forged hardened steel with a fine sandblast finish. 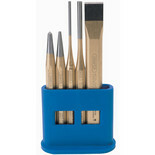 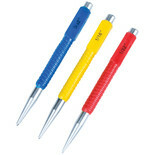 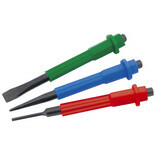 Ensure a professional finish when driving nails & other objects with this set of three nail punches. 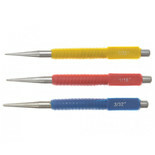 All three feature a textured grip and are colour coordinated for added ease of use. 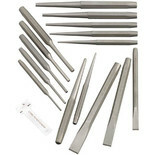 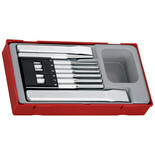 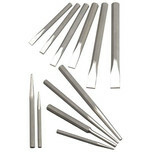 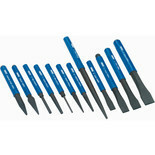 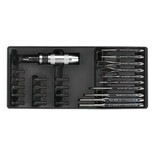 Draper's CP12NP 12 Piece Cold Chisel and Punch Set offers expert quality with the chrome vanadium steel hardened and tempered with a chemically blacked finish and plastic grips.